Copy the link below for directions. The N. Gregson Street entrance to the mall is closest to the movie theater. 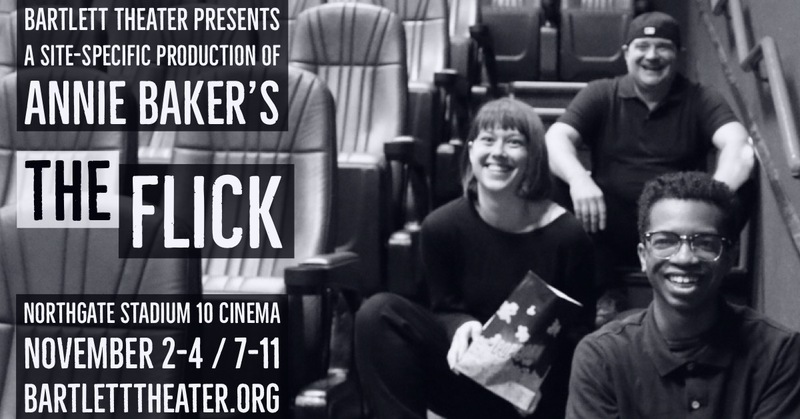 Directed by Founding Artistic Director Jonathan Brady, THE FLICK opens Friday, November 2nd at The Northgate Stadium 10 Cinema. With the ever increasing need for performance spaces in Durham, like other local companies, Bartlett is seeking out creative alternatives. This production marks Bartlett Theater’s first collaboration with Northgate Mall; Bartlett will be the first theater company to stage a play using Northgate as the venue. The Flick takes place in 2012, in a run-down, single- screen movie theater in central Massachusetts. Three underpaid employees mop the floors, scrape gum off the seats, and attend to one of the last 35-millimeter film projectors in the state. Though their lives are seemingly mundane and ordinary— their struggles and aspirations are anything but. In the dingy aisles of the theater, underneath the amusing, idle workplace banter, these characters are fighting for the noblest of pursuits: authentic connection in a world that is passing them by. Audiences will find themselves transported into these pursuits by playwright Annie Baker’s uncanny ability to equally wield silence and idiomatic dialogue. Baker’s Pulitzer prize-winning writing combined with Bartlett’s site-specific staging, will give audiences a front row seat to a hilarious, yet heart-rending immersive theatre experience they won’t soon forget. Saturday, November 3 at 7:30 PM SOLD OUT! Sunday, November 11 at 2 PM. Jonathan Brady (Director) Jonathan Brady is the Founding Artistic Director of Durham’s Bartlett Theater. His credits include, Bartlett Theater: Director: The Seagull, The Glass Menagerie; Triad Stage: Director: Reverse Psychology, The Santaland Diaries (2011 and 2012) and For Whom the Southern Belle Tolls. Paper Lantern Theatre Company: Director: The Aliens and Next Fall; Producer: Times Stands Still, Kimberly Akimbo, Next Fall, Souvenir and This Wide Night. UNCG: Director: Measure for Measure, Bus Stop and Tennessee Williams’ Orpheus Descending. Some of Jonathan’s favorite acting credits include Holy Ghosts, Love’s Fire, and Angels in America: Millennium Approaches. Education: UNCG, MFA in Directing. Vincent Bland Jr. (Avery) Vincent can be found on and off-stage at numerous organizations in the Triangle; some of his recent favorite performances include Lysander in A Midsummer Night’s Dream (Theatre Raleigh) and Dodger in Oliver! (Justice Theater Project). Jim Roof (Sam) A graduate of The Theatre School at DePaul University, Jim Roof has acted professionally in Los Angeles, Chicago, and Atlanta. Theatre credits in Los Angeles include The Complete Works of William Shakespeare: Abridged, and Faithful. Film credits include the cult phenomenon “Zombie Strippers,” as well as the dark horror film “The House with 100 Eyes,” which he also wrote and co-directed (with Jay Lee). His latest film, “Primal Rage,” opened in 2018. Ford Nelson (The Dreaming Man/Skylar) is excited to be working with such a talented team in “THE FLICK.” Ford has recently worked with Theater Delta, a traveling Interactive Theater group for social change, where he played Paul in “Don’t Worry, I’m Fine” and Will in “How ‘bout This Party?” Ford has also been seen in NRACT’s “Spring Awakening” as Melchior and in Big Wig Production’s “Bad Jews” as Jonah. Ford would like to thank his haters for hating, as their hate pushes him to keep striving, and his friends and family for their endless love and support. Jessica Fleming (Stage Manager) Jessica Flemming is a stage manager, actor, singer, and theatre educator. She has been performing for over 20 years and working in the Triangle since completing her BFA in Theatre Performance from The University of Michigan-Flint. Most recently, Jessica was part of the stage management team for Hidden Voices’ east coast tour of To Buy The Sun: The Challenge of Pauli Murray. Stevan Dupor (Lighting and Sound Design) Stevan is the founder of a theatrical lighting, sound, and projection design company, DuporDesign, Inc. He has provided design and equipment services for a wide variety of productions ranging from musical theatre to rock concerts and special events. A small selection of company favorites include: American Idiot (WPU Theatre), The Glass Menagerie, Crumbs from the Table of Joy (Bartlett Theater), Approaching Ali (N.C. Opera), Jesus Christ Superstar (N.C. Theatre Conservatory), bare: the musical (Next Generation Theater), Into The Woods (William Peace Theatre), Cabaret (William Peace Theatre), Dracula (Wakefield Theatre Co), Santigold (MTV Music Experiment), Cinderella, Peter Pan and Aladdin (Original Ballets – Legacy Repertory Co.), Panoramic Dance Projects (NCSU), Bellan-Birth of Existence &; Bellan-An Experience.